I'm working for Tradera right now and as I've blogged about before we have been splitting a big (40 people) team into smaller ones. Getting this to continue to work and the teams to be effective has been my challenging and very interesting task since then.I can tell you that without great people that care - this would have been a lot harder. With people that cares you can even allow yourselves to try something, fail and change. That's great news for someone like me - I fail a lot. And take great pride in doing so, as long as I learn from it.In this post I thought I'll describe a particular part of that process that I have had problems getting to work many times; the daily team sync, Scrum of Scrum or Syncro whatever you call it. We call it Daily Sync. I'm working for Tradera right now and as I've blogged about before we have been splitting a big (40 people) team into smaller ones. Getting this to continue to work and the teams to be effective has been my challenging and very interesting task since then. I can tell you that without great people that care - this would have been a lot harder. With people that cares you can even allow yourselves to try something, fail and change. That's great news for someone like me - I fail a lot. And take great pride in doing so, as long as I learn from it. 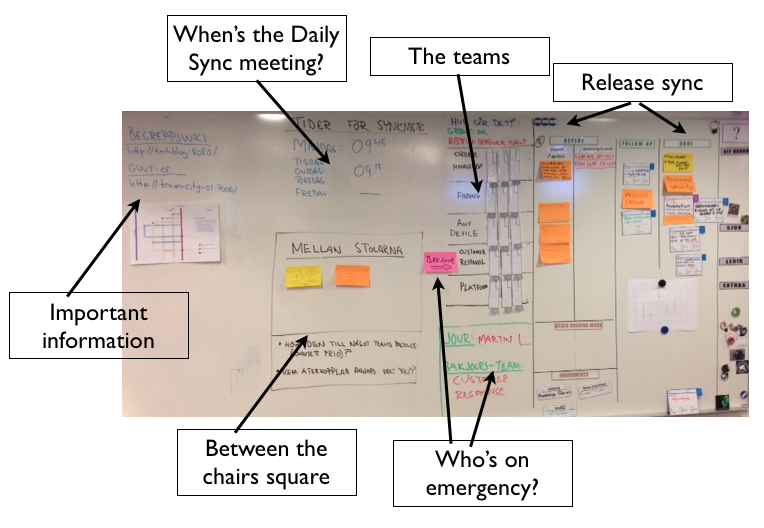 In this post I thought I'll describe a particular part of that process that I have had problems getting to work many times; the daily team sync, Scrum of Scrum or Syncro whatever you call it. We call it Daily Sync. It's really quite simple really; you have several teams and you want some sort of synchronization between them, share information or just know what the others are up to. In our case we even had one big team before, where everybody met every morning. The feeling of us knowing exactly what was going on in every part of the system was very clear and present. But did we really know everything? 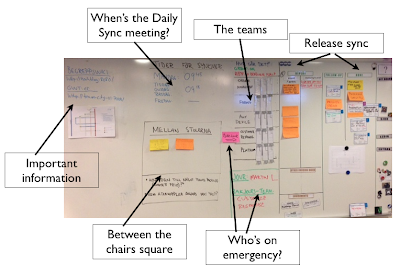 Often you create a board or some place to gather information from all teams. I personally think that it's a very good thing to visualize your work there too (as I've blogged about before, from another project) but that also froms questions about levels of details and double bookkeeping. I mean; in order to keep the big board interesting we want it to show the right level of details but that's also reflected on each team board, which in turn means that you need to have each work item represented twice. And keep them synchronized. You then have the meeting itself; who should come? What should you talk about? Are you reporting (receiving) or are you deciding (sending) information? If the Daily Sync is going to be interesting you need to talk about things that involve everybody in the meeting. Or at least things that are interesting too them. We need to look out for not having all teams restating what they just had said in their standup. Speaking of that - when should the meeting be? It can be before or after the daily standups in the teams, both options viable but giving us different advantages. Before meant that we could decide stuff in the Daily Sync and propagate that back to the teams, but we had a hard time knowing the current status of the teams. If instead the teams have had their daily before the Daily Sync we would have current team statuses but it's harder to send information from Daily Sync that stand the risk to become just a status meeting. We went back to the root of the Daily Sync - what's the reason to have such a meeting. The information about the team status is out there, in each team, on their boards and the walls surrounding them. If not - that's something we need and want to know that it's missing. But there's an underlying thing here as well. When the group was one big group we were used to hear the status of the entire group every morning - now you need to go get it from the teams. It won't be fed to you but you'll get it if you're interested. We wanted the Daily Sync to have a purpose and be a meeting that is used for something rather than just restating the information that already been exchanged in the respectively teams. That meant that we focused the Daily Sync on things that ... wait for it... needed to be synched between the teams. And that only. what is being released during the day - we have created a board with columns for "To Release", "Releasing", "Follow up" and finally "Done". The "Follow up"-column is used for things that we need to keep track on after we have released it. is there anything that's come up that fall "between the chairs". I've blogged about that in length before so I won't bore you with that here. Any other important information that everybody needs to know? Here we can talk about a lot of different things; who is on "emergency call", which team is "emergency backup", there's cake at 15 today - anything you like. Most things that we talk about and decide are some how visualized on the board. You can see example of this on the board where we show important links, dates and the "Between the chairs"-square. asking every team how things are going. We instead focus on the work and making sure that it flows quickly towards production. requiring metrics from the team on the progress. Not now at least... We have been playing with some easy way of tracking that but they haven't done us any good. So we stopped using them. One thing that has been remove since the picture was taken is the stop-lights (red, yellow and green). We thought that they could help us known how the teams were doing but we realized that we got to know which teams needed help anyhow so we have removed the stop-lights. This is how we got the Daily Sync meetings to work for us; they are short (usually under 10 minutes) and meaningful for everyone attending. Oh yeah, almost forgot; they are most certainly not like this tomorrow. They are not perfect and we change the content and form of them. Often. The only thing that's certain is that we haven't perfected this. But we're reaching there.